Hotel Cavalieri is set on the beach in St Julian’s, and has a seafront terrace and pool. All rooms are air-conditioned and offer sea views. Cavalieri Hotel’s sun deck features parasols, sun loungers, changing rooms and showers. You can use the indoor pool, which is heated between April and November. The Cavalieri serves a buffet breakfast, and Mediterranean and local cuisine for lunch and dinner. The main dining hall overlooks St Julian’s Bay. During summer you can dine outdoors, and barbecues are often served on the sun deck. The Maritim offers luxurious rooms, panoramic views, spa facilities, and free parking. It is in the northern town of Mellieha, home of Malta’s biggest white-sand beach. On the Maritim Antonine Hotel’s rooftop you will find a large outdoor pool with views of the city. Maritim Antonine Hotel & Spa includes an indoor pool with jacuzzi and a sauna. There is also a modern gym, and a huge variety of traditional treatments and eastern therapies are available on site. All rooms of the Antonine are air-conditioned and come with satellite TV and tea-coffee maker. Some rooms offer views of the sea, of the garden, or of the city. Delicious cuisine is available at the awarded The Arches gourmet restaurant, as well as in one of the Maritim’s many indoor and outdoor bars and restaurants. Barbecues are held by the pool, pizza is served on the terrace. Activities: Sauna, Fitness Centre, Spa & Wellness Centre, Massage, Children’s Playground, Hot tub, Library, Turkish/Steam Bath, Hammam, Indoor Swimming Pool, Outdoor Swimming Pool, Outdoor Swimming Pool (all year), Indoor Swimming Pool (all year). over the bay of Palma are incomparable and its location less than 1 km from one of the best golf courses on the island makes it ideal for golfers. Due to its location on the rocks, access to the beach may involve some steps. Guest rooms are equipped with bathroom, balcony (except single rooms), satellite tv, air conditioning/heating, hairdryer and safety deposit box (payable). Buffet restaurant, pool bar and bar-cafeteria. Outdoor swimming pool, indoor heated pool (Nov – Mar), jacuzzi and sauna. 7nts €30, 14nts €50. 01-08 Apr €45. Hotel THB Felip, located on the seafront opposite the Nautical Club, is the perfect place to enjoy a peaceful and relaxing holiday overlooking the Mediterranean Sea. Guest rooms are equipped with bathroom, balcony, satellite tv, air conditioning/heating, minibar and safety deposit box. A la carte restaurant on the terrace, buffet restaurant and barcafeteria. Heated swimming pool, garden and Wellness Centre equipped with swimming pool, jacuzzi, gymnasium, sauna and Turkish bath (some services payable). 24-hour reception, free wi-fi and lifts. 96 rooms in 2 buildings. Hotel THB El Cid is located on the edge of the beach at Ca’n Pastilla. Bedrooms have lateral or direct views of the sea, bathroom with hair dryer, terrace, telephone, airconditioning, satellite television, mini-refrigerator and safety deposit box. Buffet restaurant, snack bar and lounge bar. 3 swimming pools (1 heated on selected dates), gymnasium, sauna, turkish bath (extra charge), solarium. 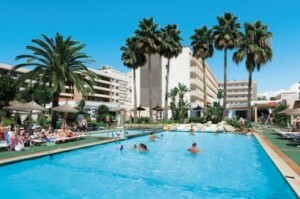 Supplement applies 20/09-06/10/11 & 21/05-15/06/12: 7nts €30, 14nts €50. 01-08 Apr €45. The Pionero and Santa Ponsa Park Complex are situated in Santa Ponsa just 300 metres away from the beach and the nearest shopping centre. Guests may enjoy the excellent facilities at both hotels including three adult swimming pools, two children’s pools and sauna. The hotels entertainment team also supply a daytime and evening entertainments programme, suitable for all ages. Guestrooms at the Pionero and Santa Ponsa Park Complex are comfortably decorated and come with all modern amenities that guests may need during their stay. For guests booking on an all inclusive basis, the following will be available: Breakfast, lunch and dinner are served at standard times* with all soft drinks and local spirits included; snacks are also available from 1000-1200 and 2100-0000. * Standard times for meals equates to breakfast 0745-1030 lunch 1300-1430 and dinner 1845-2100. The building is made up of a 12 floor main building with a total of 251 rooms of which 13 are singles and 64 are doubles. It offers a lobby with 24-hour reception, a lift and a cafe. the hotel features a its very own bar, pub, nightclub, playroom, TV room and an air-conditioned restaurant with a non-smoking area. In addition, the hotel offers Internet access (on payment of an additional fee), a bicycle storage facility as well as the option of bicycle hire (for an extra charge).This charming hotel is situated close to one of the most beautiful beaches on Mallorca, Playa de Palma. Shopping venues are located roughly 500 m from the hotel and the beach and public transport are to be found about 250 m away. Guests may use the, table tennis facilities indoor swimming pool, outdoor swimming pool, pool, snack bar, sun loungers, parasols and the sauna (for an additional fee). Located at the seafront in Palmanova, and a kilometer away from the vibrant sector of Magaluf, the Delfín Playa Hotel is ideal for family vacations with its own playground and entertainment team. The 144 rooms, most of them with a sea view, are equipped for a pleasant and comfortable stay. The Delfín Playa Hotel has two exterior pools, and an acclimatized one. 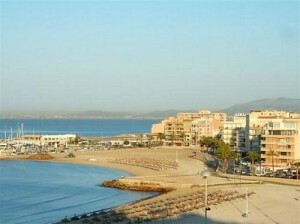 It is only 50 metres away from the main beach of Palmanova, one of the mot touristic beaches in Mallorca. A nice and comfortable setting decorates the Delfín Playa Hotel rooms. All of them are equipped with a phone, satellite TV, sound system, safe box, air conditioner / heater, chairs and a hairdryer. Set overlooking the sea, this hotel is only a short walk away from Can Pastilla beach. It is only 100 metres from the bus stop that takes you to Palma city centre. Las Arenas hotel is the ideal place to enjoy a holiday on the beach and in the Majorcan sunshine. From here you can also easily get to a variety of shops, restaurants and bars. Located in one of the most beautiful part of the Southwest coast Mallorquina, along a white sand beach and crystal clear waters. Cal Vinas is a small village and the closest town is Magaluf, a 25 minute hilly walk away. The rooms have complete bathroom with hairdryer, air conditioning / heating and safe. Another popular Barcelo Hotel, in Playa de Palma, so ideal for exploring Palma and north coast of Majorca, the hotel is situated 300 meters from the promenade and beach, bicycles would be an idea way to explore from here and this hotel specialises in cycling holidays.